The Koala Miniflex is the ideal pediatric wheelchair for toddlers. While it is scaled to fit the needs of children, the Koala is built with the same rugged motor and front-wheel-drive technology as Permobil's full-size adult chairs.The low seat-to-floor height allows little users to interact at the same height as their peers, and the integrated elevation provides them with easy access to a variety of surface heights such as tables and desks. Plus, the tilt feature offers improved stability and rest, a necessity after a long day of play. 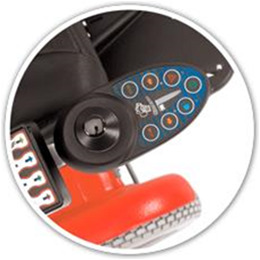 The Koala Miniflex Front Wheel Power Wheelchair is available many colors. Call us for more information. Armrest Pad Lengths 8", 10"
Seat Widths 10", 12", 14"
Seat Depths 10", 12", 14"
Backrest Heights 14", 16", 20"